Usage and exchange of geodata is fostered by geo.admin.ch in a significant way. 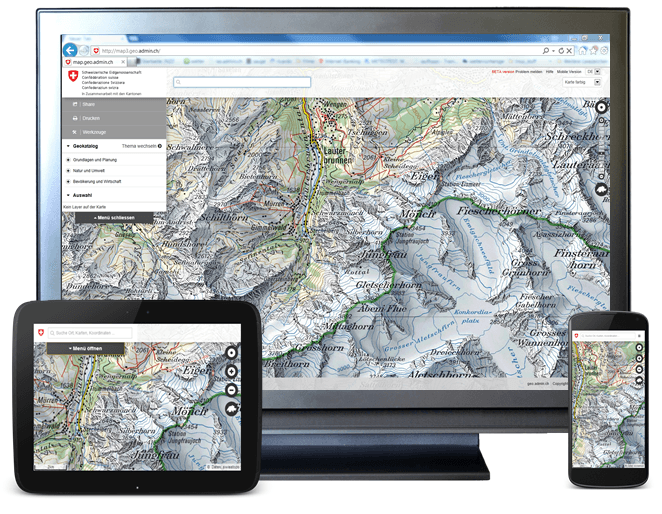 The Federal geoportal is operated by the Federal Office of Topography, swisstopo, on behalf of the coordinating body for Federal geographical information with the aim to implement the Geoinformation Act. The purpose of this Act is to ensure that geodata relating to the territory of the Swiss Confederation is made available to the Federal, Cantonal and municipal authorities, to industry and commerce, to academic and scientific institutions and to society at large, for the broadest possible use, in a sustainable, up-to-date, rapid and easy way, with the required quality and at reasonable cost. The combination of an open source software framework with an innovative cloud computing architecture resulting in an attractive cost / benefit ratio. Furthermore, geo.admin.ch was an early innovator in Switzerland using cloud computing as infrastructure solution for authorities. With a commitment to open source and open standards, the initial map viewer version could be brought to readiness for market within just 3 months of time. Our choice had an impact on other portals worldwide and has been reused several times. Based on the success of map.geo.admin.ch, a public private partnership, with international members, was initiated by geo.admin.ch to extent an existing open source mapping framework to support mobile devices / smartphones and enable the development of OpenLayers3. A well-documented set of services enables the reuse of geodata for other needs: besides offering OGC WMS and WMTS services, the web community is also served with RESTful services. Approximately 400 official geo datasets covering topics from leisure/hiking to cadastral maps can now be used by the broad public and private industry. So far, the federal portal received twelve awards and nominations, on national and international level, for its success in fields such as webmapping technology, cloud computing, mobile and eGovernment. Reducing the access requirements for the federal spatial data infrastructure to a web browser is the first step to open access. Using the web not only for linking and exchanging data but also to view data in a browser was a key decision on the launch in 2010. Accessing maps in areas without network coverage is possible with the mobile mode of map.geo.admin.ch/?mobile=true. A recently released function allows the download and local storage of a predefined map extent for offline usage. This feature meets the needs of individual users and provide opportunities to extend application possibilities. With the ability to store map data locally on mobile devices such as smartphones or tablets, maps can now also be used without internet connection in a browser window. Positioning via GPS in real time is enabled. The use of an additional app is not necessary. Maps including thematic overlays of a selected screen section can be stored locally depending on the available free space on the device and are thus accessible offline. The availability of the functionality itself and the amount of storable thematic maps is OS and web browser-dependent. The function allows initially the local storage of an area of 10×10 km. New web standards allow the use and management of spatial data in the browser cache: no plug-ins are required but existing web standards are used. This recent version of the offline function includes various improvements based on user feedback of the BETA – version. Certified Senior Project Manager IPMA B with significant experience in geoinformatics / remote sensing / modeling. Experienced as strong and initiative team player, scientist and project manager. Analytical and interdisciplinary working skills. Responsible for the multi-awarded Swiss Federal Geoportal geo.admin.ch and map.geo.admin.ch. PhD of the University of Bern.